"It is clear to us all that today’s world is in need of a new evangelization, a fresh accounting on the part of Christians for the hope that is in them (cf. 1 Pet 3:15). Yet those who profess that Jesus Christ is Lord are tragically divided and cannot always give a consistent common witness. Herein lies an enormous responsibility for us all." The address came at a time when unity faces pressure from within the Church. In the U.S., some debate will be anticipated over liturgical reforms. For example, Gerald at The Cafeteria Is Closed reports today that Cardinal Mahony in Los Angeles has responded to Bishop William Skylstad's letter of October 23, which notified U.S. bishops that Benedict XVI has discontinued the indult that previously allowed extraordinary ministers of Holy Communion to help cleanse cups. In response, if the letter is accurate as initially reported by Gerald, Cardinal Mahony has said that there will be no change in the practice in the Archdiocese of Los Angeles until he has a chance to discuss "the new recommendations" with the U.S. Conference of Catholic Bishops. Perhaps a canon lawyer can explain how the termination of an indult is a "recommendation" if that language accurately reports the letter. Without using the phrase "new recommendations," the Diocese of Orange has also indicated that it will await the November meeting of the USCCB before making any changes in procedure, also as published by Gerald. There has also been hope in the U.S. that improvement in the English translation of the liturgy will reduce some of the pressure for the Latin Mass. While there is reason to anticipate some conflict in the U.S., it is in France where the conflict is presently most visible, involving both the concern of some French bishops over the potential wider use of the Latin Tridentine Mass as well as concern over the new Institute of the Good Shepherd, which was organized in September for Le Febvrists returning to the Catholic Church. Cardinal Jean-Pierre Ricard, who is the Archbishop of Bordeaux and head of the French Bishops Conference, welcomed the concept of bringing LeFebvrists back into the Church several months before the Institute was created. However, he has been among those who have recently voiced concerns about the difficulties of welcoming LeFebvrists back into the Church despite their rejection of conciliar decisions of Vatican II, or at least rejection of the way those decisions are put into practice. The issue of liturgical reform, the wider use of the Latin Mass, and the Institute of the Good Shepherd should be recognized as, indeed, three different but related issues. This post will link to a couple of recent English language articles on the French situation and will provide some discussion about several French news articles to shed more light on that situation, and on how it may in time affect the Church outside of France. Where French language articles are quoted in English, all translations here are mine. Cardinal Jean-Pierre Ricard, who is the Archbishop of Bordeaux and head of the French Bishops Conference, was received in a private audience with Pope Benedict XVI on October 26 according to Vatican Information Service. The purpose of his visit is thought to have been the Institute of the Good Shepherd and the anticipated expansion of the Tridentine Mass. Cardinal Lustiger, the retired Archbishop of Paris, was received by the Pope earlier this month, at least partly for the same reasons. Also on October 26, Cardinal Francis Arinze (Prefect for the Congregation of Divine Worship) met with some opposition in Paris, where he denounced liturgical abuse during a meeting of 200 liturgical experts and about 20 French bishops (English translation here). An article in The Tablet considered the French situation in an October 28 issue, and an article in the Washington Post considered the French situation on October 23. In an October 27 post, French blogger Lahire at Le Salon Beige called for prayer that the French Church will unite behind the Pope, linking to this article about the anticipated approval of the Latin Mass and reform of liturgical abuses. On the same day, Michel Janva of the same group blog wrote at more length about the conflict. On October 26, articles about the anticipated expansion of the use of the Latin Mass, and the related French issue of the LeFebvrists, appeared in Le Figaro and La Croix. By way of background, although Cardinal Ricard, the Archbishop of Bordeaux is now at the center of attention for questioning whether Benedict XVI may be about to take a step too far in broadening the use of the Latin Mass, it is important to set that in the context of the fact that Cardinal Ricard previously spoke with support for bringing the LeFebvrists back into unity with Rome. "We should not forget that the bishops of France, meeting in their spring assembly had placed this question on the agenda on April 7, 2006, and that Cardinal Ricard had inter alia made a three-point declaration in which can be read: "We know that Pope Benedict XVI is concerned about that. In the weeks or the months to come, he should give directives to facilitate the path towards a possible return to full communion. We will welcome them into the faith and will faithfully put them to work. Evangelically, wrote the Cardinal, all must be done in order to carry out the word of the Lord: "That all may be one, like you, Father, are in me and I in you. That they too may be one in us, so that the world may believe that you sent to me "(Jn 17, 21). (...) Charity implies that we seek to know each other, to understand each other, to make false images disappear that we can have of each other." On September 8, 2006 the Vatican created the Institute of the Good Shepherd for for five traditionalist priests - all former followers of Archbishop Lefebvre - which would answer directly to Rome and not to local bishops.In the article from The Tablet, linked above, it is twice suggested that the French bishops reacted as they did to the Institute of the Good Shepherd, and to the more recent news that wider use of the Latin Mass may be approved, because they felt snubbed. However, statements made by the French Cardinals, including those quoted by The Tablet, are not based just upon thinking that they should have been consulted more about that Institute. On the other hand, among French Catholics who support Benedict XVI, there was concern that only French Catholic bishops were protesting. French blogger Michel Janva, in the post linked above, thus wondered if the reaction of some French bishops gave "the impression that the divisions from the post-conciliar years have not yet passed. At least at the level of the Episcopate. And of the French Episcopate, one must insist, for abroad, obedience to Rome (or at least a lack of violent criticism) seems to be the norm." As an example of a bishop with a contrary view, he quoted Bishop Alvaro Corrada of the Diocese of Tyler, Texas, who stated that he considered the Mass according to the 1962 missel, especially with the encouragement of Pope John Paul II, to be a normal thing. It might thus come as a relief to the French who share Cardinal Ricard's concerns (of course, not all French clergy share those concerns), and as a relief to the French who share the concerns of the bloggers at Le Salon Beige, to see that they have such American brethren as Cardinal Mahony, whose reaction to a much lesser matter may assure them all that the Vatican's concerns do not lie solely with the French Church. "The document that Pope Benedict XVI is preparing with a view 'to encouraging the Latin Mass' will take the form 'of an Apostolic Letter – Motu proprio', a stronger form that an 'Apostolic Letter', is still being edited at the Vatican. The Congregation for Divine Worship and the Discipline of the Sacraments is actually working on the text, as is Cardinal Dario Castrillon Hoyos, prefect of the Congregation for the Clergy and president of the Commission Ecclesia Dei, in charge of the traditionalists in the Church. According to a Vatican source, the Pope has reviewed the text at least “two times” and the document is 'almost ready.'" Also, for good or for bad, it has become apparent that the creation of the Institute of the Good Shepherd, to bring traditionalist priests back into the Church who formerly rejected the conciliar authority of Vatican II, could have implications outside of France. A former SSPX priest who is now in the Institute of the Good Shepherd expressed to the French news media just one week after the Institute was created that they intended to spread the Institute to other countries. We might wonder whether this will be viewed as an opportunity by traditionalist Catholic clergy within, for example, the Diocese of Orange. The Bishop of Orange drew recent blogger attention for prohibiting a traditionalist parish from kneeling to receive communion and other such traditionalist customs. "Mr. L’Abbe Laguérie affirmed Wednesday that the new Institute of the Good Shepherd created last week by Rome wished to open parishes 'everywhere in France and elsewhere'. "'It will not be a factor of division, on the contrary', the abbot Philippe Laguérie, superior general of the institute, declared to the press. "The institute looks for unused or abandoned churches in the downtown area. 'It is not a question of arriving and warning the bishop afterwards', he ensured, 'the canon law makes compulsory a dialogue between an institute and the local bishop'. "The convention which should be signed for the Saint-Eloi church in Bordeaux, that it has occupied since 2001 in the diocese of Cardinal Jean-Pierre Ricard, president of the Conference of the Bishops of France, and where the institute will have its seat, "will be the prototype of what we want to make everywhere in France and elsewhere". "According to the abbot, Mgr Ricard and Cardinal Dario Castrillon Hoyos wish to carry out the first ordinations. Four seminarians are ready. The institute already counts six priests and will welcome ten South American priests. "The Vatican decree creating the institute makes it possible "to take part in a serious and constructive criticism" for an "authentic interpretation" of the Vatican II Council and gives them the right to celebrate exclusively the Mass of St. Pius V."
"I do not speak about France, which I do not know sufficiently", he specified, but these abuses led to 'this coldness, this horizontalism which puts man at the center of liturgical action, and sometimes with this overtly egocentric mannerism that our Sunday assemblies are sometimes obliged to endure'." As many American Catholics will recognize their own concerns about liturgical abuses in the descriptions offered by Cardinal Arinze in that address, it may be reasonable to speculate that the expected November Motu Proprio may seek to reform abuses within the American Church as much as it responds to concerns of the LeFebvrists about the Latin Mass. If parishes of the Institute of the Good Shepherd begin to form in such places as the Dioceses of Orange and Los Angeles, we may soon find that what we thought was specifically a French reaction may also become an American issue. In making final revisions to the pending Motu Proprio document, Pope Benedict XVI is no doubt taking all of those concerns into consideration. While that document may be in the final stages of review, and as we approach a November that may include its release as well as a meeting of the U.S. College of Catholic Bishops and the Holy Father's journey to Turkey, I hope that we will keep these issues in our prayers, with an eagerness to see God's will be done in the final outcome of these anticipated events. 'But by reason of their special vocation it belongs to the laity to seek the kingdom of God by engaging in temporal affairs and directing them according to God's will. They live in the world, that is, they are engaged in each and every work and business of the earth and in the ordinary circumstances of social and family life which, as it were, constitute their very existence. There they are called by God that, being led by the spirit to the Gospel, they may contribute to the sanctification of the world, as from within like leaven, by fulfilling their own particular duties. Thus, especially by the witness of their life, resplendent in faith, hope and charity they must manifest Christ to others. It pertains to them in a special way so to illuminate and order all temporal things with which they are so closely associated that these may be effected and grow according to Christ and may be to the glory of the Creator and Redeemer. (LG 31).'" 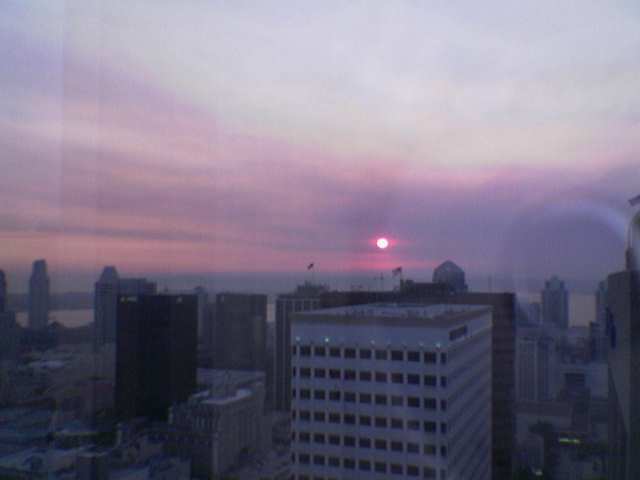 Today's photos: View from a San Diego office building tonight, with a smoky sunset, as an arson fire in the San Jacinto Mountains some miles east of here blows smoke out toward the sea. Although the fire is a long way from here, I could smell the smoke today on my way home from my office. Four firefighters died today while fighting that fire. "To you, Pastors of God's flock, is entrusted the mandate of safeguarding and transmitting faith in Christ, passed on to us through the living tradition of the Church and for which so many have given their lives. To carry out this task, it is essential that first of all you show you are "in all respects a model of good deeds, and in your teaching show integrity, gravity and sound speech that cannot be censured" (Ti 2:7-8)." "I am happy to be here in "my' University, because this is the University of the Bishop of Rome. "I know that here, one seeks the truth, and therefore ultimately, one seeks Christ, who is Truth himself. "This road to truth - the effort to know truth better in all its expressions - ia actually a fundamental service of the Church. "A great Belgian theologian wrote a book entitled "The love of words is a desire for God", showing that in the monastic tradition, both things go together, because God is Word and speaks to us through the Scriptures. "Therefore this supposes that we read, we study, to deepen our knowledge from books and therefore, deepen our knowledge of the Word. "In this sense, the opening of a library is both an academic and university event as well as spiritual and theological, because by reading, along our path toward the truth - in studying words in order to find the Word - we are in the service of the Lord. "It is a service of preaching to the world, which has need of truth. Without truth there is no freedom and we are not fully within God's original plan. "Thank you for your work. God bless you in this academic year." 1. Mother Anne-Thérèse (Theodore) Guérin - The Archdiocese of Indiana has a web page concerning Mother Guérin and links to news coverage, including a reference to an EWTN broadcast of today's Mass. Mother Guérin was a Frenchwoman who was sent by her order to the United States, where she started a mother house and schools. 2. Father Filippo Smaldone - An Italian priest who had a mission to deaf mutes. 3. Father Rafael Guizar y Valencia - A Mexican priest who had missions to Mexico, the United States, Cuba and Guatemala, and who became a bishop. 4. Mother Rose Venerini - An Italian woman who founded the Congregation of the Maestre Pie Venerini, which created 40 schools in Italy by the time of her death, works particularly for the education of young women, and also has assisted Italian immigrants to the United States. The Holy Father's homily is available in English translation at the Vatican website and Papa Ratzinger Forum. An article with quotations is available from Asia News. The Vatican separately provided a translation of the Angelus address immediately following the Mass. "A saint is that man or woman who, responding with joy and generosity to the call of Christ, leaves everything to follow Him. Like Peter and the other Apostles, like St. Teresa of Jesus (Teresa of Avila) whom we remember today, and numberless other friends of God, the new saints went through this exigent but satisfying evangelical itinerary, and received back - along with the trials and persecutions of their earthly life - 'a hundredfold', as well as eternal life. " The Catholic Communications Network in England and Wales posted an interview with Cardinal Cormac Murphy-O'Connor, the Archbishop of Westminster. The interview is dated October 10, and it follows his half-hour audience with the Pope on October 9 as well as his meeting with Russian Orthodox Patriarch Alexis II at his official residence in Moscow on October 4. The Cardinal was interviewed by Rome-based journalist Gerald O'Connell. Topics included Catholic and Russian Orthodox ecumenical discussions as well as Catholic and Anglican dialogue and the Archbishop of Canterbury's visit to Rome planned for next month. Q. So he doesn’t see any great problems in the Church in England and Wales? A. No. I mean, clearly there are problems but they are the problems that affect the whole of secular society and we all know them. On the contrary, the Pope was saying to me in different ways how he appreciates and respects what the bishops are doing, and their endeavors to deepen the prayer life of their people, endeavoring especially in the field of adult education to actually strengthen that. And when I told him we were discussing a lot the formation of our people, I think he was very pleased. The Pope wants people to have a deeper faith today, because without faith we cannot change the situation. The real crisis is – I think - a crisis of faith. The Pope sees the need for people to express their faith in an articulate way; and for this there needs to be faculties which are actually able to teach lay Catholics – men and women, to express their faith. He’s not just talking about seminaries, although that is extremely important for the formation of priests; he is talking also about helping our lay people to express their faith in a fully articulate way in the secular culture today. I said to him that I think there is a “Christophobia” among many intellectuals, who think of putting religion on the periphery of society, saying religion is a neutral fact, whereas in fact they are trying to neutralize religion. He nodded and made clear he thoroughly agrees that you cannot separate faith and reason, you cannot separate religion and life. 2008 Synod Topic: "The Word of God in the Life and Mission of the Church"
The Holy See Press Office reports that Benedict XVI has called an assembly of the Synod of BIshops to be held October 5 to 26, 2006 on the subject "The Word of God in the Life and Mission of the Church." It will be the second such synod of his papacy and the twelfth Ordinary General Assembly of Bishops. In October, 2005, he presided over the eleventh such assemby, called by Pope John Paul II on the subject of the Eucharist. The Synod of Bishops was established by Pope Paul VI in September 1965 in response to the wish to continue the collegiality of the Second Vatican Council. That word of the Lord, we heard it two times, in the passage from the book of Revelation, which was our first reading. It resonates within us in a strange manner on this day on which we entrust to God the life of a man whom the Lord has just called to Himself, just short of his 94th birthday. Since mid-July, this preaching friar who had spoken and taught so much, was silent, he had entered into silence! From his youth, Father Marie-Dominique learned from his Dominican uncle, Father Dehau, to consider the book of the Apocalypse as a fountain of hope, a comfort, a support in times of testing. He who “will come to judge the living and the dead” approaches us each day. By the Word of Life and by the sacraments that the Lord left us, eternity comes to pass nearby each one of our days. Father Marie-Dominique Philippe was the man of the Source [The French word "source" means both "source" and "spring", as in a spring of running water.]. Contemplating Jesus on the cross, he saw in that love that went on to the end, to the extreme, the summit of all wisdom. He wanted unceasingly to go up to that Source, and he invited us, us his students and you his brothers and sisters, to not “go with the flow,” to never leave the demanding and joyful path that goes up. Men, in the beauty of their existence created in the image of God, in the nobility of their intelligence, the Lord’s disciples will only be truly refreshed with living and vivifying water. Truth, which is the Dominican family’s currency. Truth, a supreme good, which holds an essential place in the prayer of Jesus, as we just heard: “Consecrate them in the truth. Your word is truth.” (John 17:17) Between man who seeks with sorrow and God who gives Himself generously, the meeting point is the sanctuary where we meet to prostrate ourselves and to enter into worship. That is the interior attitude to which the first commandment invites us: “Word of life”: “You will worship” There, all the charity of God is communicated to us. Worship and charity, for Father Philippe, are without doubt two of the most precious words of the spiritual life. Charity is like a river of kindness which comes from God and goes down onto men. That vision made Jesus thrill with joy, through the working of the Holy Spirit (Luke 10:21). It is living in the present, remaining available in a concrete way, in relationship with those near to us. It begins with the splendid experiment of friendship, a subject so dear to Father Philippe’s heart. Friendship, for him, was “the pearl of the human heart.” God knows if he was himself admirable and faithful in his friendships, even in difficult circumstances. Life did not spare him, and he knew suffering. With a very fine humanity, a sharp sensitivity, he knew how to live those moments that, most often, dumbfound us completely. With courage, with nobility of heart, he set out again, despite testings, in search of a truth that one can find only by charity. He looked at the world, he listened to people, he loved all he knew, with a particular affection for the young! He even said that he had the impression of understanding them better at the age of 90 than at 50. Youth, “I see in it,” he said, “a great desire for light and truth, like a new enthusiasm.” The young were for him a source of inner joy. Father Philippe was truly indwelled by hope in his search for truth. He was convinced that one can always go deeper, to the origin of the philosophical question. Philosophy, for him, begins with the observation of the world that provokes astonishment and leads to amazement. Like a child, the philosopher poses his questions and must never fear to go to the essential. One could say that his philosophy is ambitious. He does not intend to stop with commentary on texts, with analysis or with description of situations. Ardently, he seeks truth. Metaphysics is for him neither a luxury, nor a superior science. And he is happy to see that “a poor country woman,” as he said, Marthe Robin, encouraged him to continue this difficult work, rather than to go to preach retreats in monasteries. The Church needs it. With a great interior energy – that is the thumos of truth – he continues his search and asks still and always. For him, philosophy is a via inventionis, a road of discovery. One goes out, one seeks, one hesitates, then one perceives the order of things, relations are established, and it is a wonder to share with others what one has discovered. Such is the joy of one who teaches philosophy. All that, of course, closes nothing, stops neither with a circle of friends nor with a school. Father Philippe surprised by the diversity of his contacts: he maintained fruitful relationships with intellectuals from diverse disciplines and philosophies very different from his own. He spoke often of his meetings with artists, for whom he had a real admiration and perhaps a wisp of envy. How beautiful is intelligence open to a variety of cultures, expanded by the observation of the world and the broad love of all those whom He has given to us to be near! It is ready to welcome the revelation, with a real breadth. In theology, St. Thomas was very quickly given as master to Father Philippe, by Father Dehau and by the Dominican order. Theological work is a rational path in which all of spiritual life is engaged. It is a mysterious adventure, for the revelation is a love that gives itself and leads us in its vigor. In reading what Father Philippe wrote of the “three wisdoms”, I have often thought that the last two, theology and mysticism, are so dependent that they merge. For him, surely, as for the great cantors “practiced in divine music” who have carried the Christian message to us since Antiquity, “theology is written on the knees.” That is the Apostle John who tradition calls “o theologos”, the theologian. And, in fact, when Father Philippe gave conferences or courses, his audience perceived a grace which invited them to enter into prayer. The texts that we have heard in the liturgy of the Word are all clearly Johanine: Saint John, whom he loved, and who Saint Thomas taught him to love more. St. John, whom he gives as a model for his proximity to the Lord. St. John, who can do so much, according to him, to clarify the Church’s present and future. “In the renewal of the Church,” he said, “it is necessary that there should be that perspicacity of intelligence, that purity of heart, and that youth which, according to St. Thomas Aquinas, characterize the holiness of St. John.” But if I stopped there, I would have the impression of having said nothing yet. For Father Marie-Dominique Philippe was first of all a priest. His ministry and all his life are situated by the Cross of Jesus. It was enough to see him celebrate Mass to understand that the Eucharist was not for him a treatise of theology, but first of all a mystical adventure that leads to the source of salvation. Entirely given to his mission, he was always accessible to those who addressed themselves to him, patient to listen to them. In his attention to their regard, his proximity with the mystery of the Cross and his intimacy with Mary showed through. He wanted to invite them into the love of communion that united Mary and John, the image of the incipient Church, at Golgotha. His compassion was for him the source of an immense hope, sometimes excessive. He was convinced that, whatever his misery, a man is awaited by God’s mercy. From any wound, he could be cured, be raised, reappear. Sometimes this fatherly heart trusted, trust too much, beings so fragile that he should have had more closely accompanied, and perhaps tested more, brothers to whom he should have listened more, for a fairer discernment. If he searched for all paths to healing, it was especially with the intention that the testimony of the Father’s love be close to each one. This mystery of compassion finds, for him, an exceptional model in the presence and silence of Mary at the foot of the Cross. It is the moment when Jesus trusts his mother to the care of the beloved disciple: “Woman, behold your son. . . behold your mother.” (John 19:26-27) Several among you would have liked, I was told, for this passage of St. John to be read, as it is foundational for your community and in the whole life of the Church. Finally, you chose to contemplate the sacerdotal prayer, the Lord’s long and precious message, on the vigil of His passion. That prayer helps us to understand the depths of the mystery of compassion. When we understand the words by which Jesus evokes his union with the Father, “That they may be one, as you, Father, you are in me, and I in you (17:21), we understand what the unity can be that He proposes that we live with each other, in our communities, in the Church or in the family. The source is in the Trinitarian communion, and the first example of it is offered to us by Mary, the All Holy, and John, the beloved disciple, at the foot of the Cross. In the history of the Church, Father Marie-Dominique rightly loved those in whom he recognized that mystery of compassion. You know their names: St. Dominic, who often exclaimed: “My mercy, what are sinners going to become?” St. Catherine of Siena, John of the Cross, “my old friends,” as he called them. Of St. Thérèse and her “little way,” he said: “She touches what is deepest.” Then, we must mention Marthe Robin, who lived the Passion of the Lord each week and who mattered so much to him, St. Faustina, and Mother Teresa very indwelled by the cry of Jesus on the Cross: “I am thirsty!” But always, and first of all, St. John and the very holy Virgin Mary. One among you told me, “Never have I heard anyone speak of Mary like Father Marie-Dominique Philippe.” For him, in the company of this Mother, one grows in the spiritual life, which is to say that one becomes little again, until being only a little one like the Beloved Son nestled at his Mother’s breast, “the fruit of her womb.” Mary invites us too to learn the path of the Source, the Source of a love that Jesus alone knew and that, by the Incarnation, he came to reveal to us: “No one has ever seen God: the only Son who is in the bosom of the Father, it is He who has revealed Him.” (John 1:18). For him, it was more important to form his students’ spirit and heart in this mystery of the compassion than to write books for them. He especially loved to communicate to them the thirst to receive God’s gifts directly. I would like to address myself most especially to you, the sisters and brothers of the “St. John family.” On April 8, 2001, some bishops were brought together with the bishop of Autun to tell Father Philippe of the French Church’s recognition, and to listen to him reflect on its charism and its foundations. He had come with some brothers, chosen from his close collaborators. He explained to us his profound attachment to the successor of Peter and spoke to us of the exchanges that he had had with the Holy Father. One day, he told us he had received from him a clear message: “Tell your brothers that the true founder of the Congregation of St. John is St. Dominic.” His bull of canonization, he explained to us, presents St. Dominic not as a monk or an apostle, but as a vir evangelicus. In that, he follows Christ. It is not a question of knowing if he is contemplative or active, since Christ was both at the same time: a being turned toward the Father and entirely given to his brothers. “Vir evangelicus, there it is for us, in the Congregation of St. John, the essential expression.” That sheds an additional light on Marthe Robin’s view of Fr. Philippe: “He is a man who profoundly saw the Gospel.” And, so that the word vir does not imply any isolation (! ), he added: “A little contemplative who gives himself totally to God . . . putting all his confidence and his hope in Mary, is there anything more beautiful? Father Philippe thus leaves you the figure of St. John as a treasure. One could say that he went up from St. Dominic to St. John to touch the Lord more closely. He wishes the renewal of your theological life by the perspicacity of intelligence, to serve faith, by the purity of heart, to serve charity, and with the vigor of youth, to serve hope. May the power of that prayer be a great comfort for you in the accomplishment of your vocation and of your mission. As Pope John Paul II invited us in entering into the new millennium: “Let us go forth in hope, with the support of Christ, with love for men.” Duc in Altum! May the Lord grant that we live this celebration with thanksgiving. I am happy to welcome you here, to the Primatial Church of Saint-Jean, in light of the approach of September 8, the Nativity of the Virgin Mary, a great feast for Catholics in this city of Lyon, which is also the anniversary of the birth of Father Marie-Dominique Philippe. He just left us as a poor man, without glory, accompanied by the attention and affection of several close relatives, in the great house of Saint Jodard, deserted at the end of summer by the many brothers who usually stay there and who had been called away by apostolate missions. Father Philippe lived in the present; all counted for him as “now” and “the hour of our death.” Filled with hope, we pray that this now is the moment of a new birth, another dies natales, the day of his definitive meeting with Jesus who “comes to make all things new.” (Rev. 21:5). I greet my brother bishops, priests and deacons, the religious men and women, and especially those of the Dominican family, the faithful present in la Primatiale and in the square, as well as those who are participating in this liturgy by way of radio or television. I would like to mention with a particular affection the contemplative sisters, the apostolic sisters and the brothers of St. John who, since last Saturday, have been living an exceptional week, the intense reunion of a family gathered by the death of their founding father, days full of gravity and rich with brotherly charity. You have received these moments as a time of community retreat and a gift of light. With you, we are in thanksgiving. Wednesday morning, in Rome, I had the occasion to have an exchange with the Holy Father who charged me to tell you of his friendship. It is he whom we hear first since, by the intermediary of the cardinal Secretary of State, he sent a message of prayer and of communion to Father Jean-Pierre Marie and to all those who participate in this Farewell Mass. I thank Monsignor the apostolic nuncio for having accepted the invitation to read it to us at the beginning of this celebration. Let us then offer ourselves in silence to that love and ask Christ for His mercy for ourselves and for all men, humbly confessing our sins.